"i care about the real future and oil peak economy"
Volunteer open call in Upsate New York - Summer 2019. ​Rosekill is sixty acres of rural land neighbouring five hundred acres of forest in the Hudson Valley. (2 hrs from NYC). On this beautiful dream place artists (mainly dancers, performers and musicians) come together with ecologists, activist and farmers from all around the world. During the summer we host performance events, concerts and potlucks for the community. We have invested in creating a permaculture designed garden and orchard in order to feed everyone who visits Rosekill that gets their hands on dirt while they stay here! ​People are welcome to experience helping to grow healthy and wholesome food that will feed their community. Come and live on a breathtaking piece of land with cedar, pines oak and maple forests all around. Take as swim everyday in our lake and enjoy peace. While being here you will meet a wider community of small farms and wonderful people & projects in the area as well as the possibility to create connections to NYC with all the interesting visitors and friends who are related to our project that come visit us during our summer cultural programing. In exchange for 3 half days and one full day of help with our vegetable-growing and Art farm tasks (collecting firewood, preparing food, cleaning up, helping artists set up and meeting people). accommodation on a tent, a trailer or a barn. communal barn equipped with lots of acoustic and electronic instruments, projectors and performative art supplies. sacred fire pit with endless supply of firewood to warm people hearts and bring lovely people together. cob oven to bake anything! access to incredible hidden nature and wildlife including a lake to swim and hang out. feel free to check us out in social media or insta #rosekill to have a look into some of our wolrd. We are an all race and gender inclusive family of radical artists that encourage mutual respect and equality. Contact us if you are interested to apply or know more about the program. Hands-on construction workshop with Guadua Bamboo. This combined 'theoretical' and 'hands-on' workshop, verbally and physically demonstrates to the participant the architectural concepts and techniques applied to bamboo construction. The 3 day workshop will result in a new outdoor bamboo shading structure. While building, you will learn about bamboo framing, joinery techniques, tools and many other interesting aspects about this fast growing, sustainable material. How to Bamboo from Chloé Vadot on Vimeo. Friday 13, saturday 14 and Sunday 15 of October 2016.
sixty acres of rural land in the Hudson Valley. On this beautiful land performance artists and permaculturists come from around the world to attend and participate in many outdoor festivals and educational programs for Performance Art and ecology. Architect based in NYC with 10+ years of experience. Founder of OFICINA. Oficina provides design and construction strategies geared towards sustainable design and socially engaged architecture. 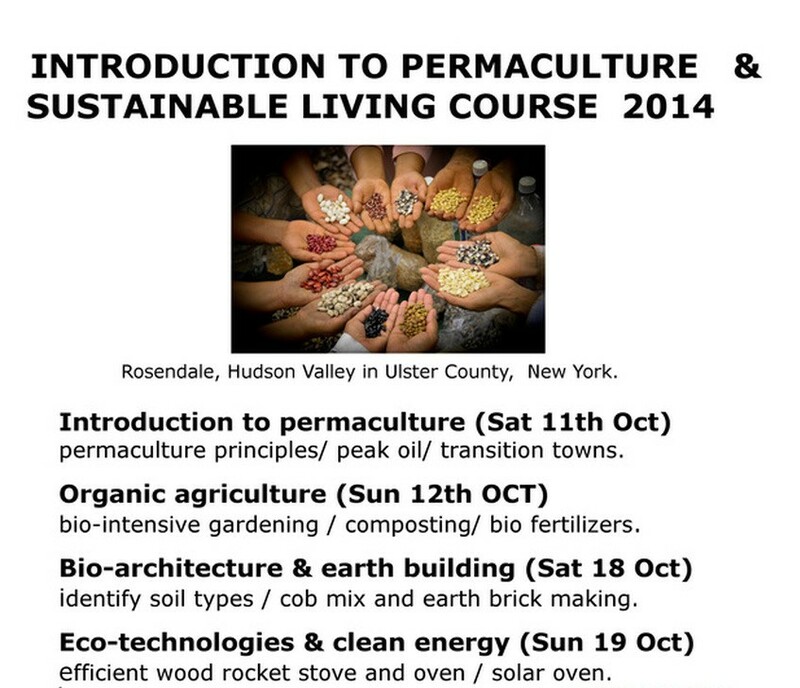 Permaculture designer and multidisciplinary artist based in Mexico city and New York. He incorporates the audience, public space & architecture. A social practitioner in permacultural networks, interacting with squats, ecologists, artists hubs, activists, gallerists, cultural entrepreneurs. EDUCATIONAL PROGRAM IN MEXICO CITY, FALL - WINTER 2016. We are a urban community inspired by Permaculture. Through experimentation we seek sustainability within urban life. Nowadays the tendency to consume industrial agriculture contributes in a series of social, economic, environmental and nourishment aspects, amongst others. Over the years, life in Mexico City has become complicated as a result of constant stress. Cualti through urban agriculture is looking forward to create a social network of people that have a green and productive space in their own home, where they could enjoy peace; tranquility and cultivate their own organic food, with the possibility to collaborate in a local market, amongst other advantages….. This ia a permaculture institute we are building nearby Palenque town, on the state of Chiapas. We offer permanent education in all topics arround sustainability on the countryside. PERMACULTURE INSTITUTE IN SOUTHERN MEXICO.